Craigellachie volunteers Ken and Beth Fraser, Gill Reid, visitor centre manager of Speyside Cooperage, volunteer Dennis Cooper, Sharon Wakefield, cooperage senior visitor centre assistant, Jane Tweedie, chairwoman of Craigellachie Village Council, Brenda Cooper, secretary of Craigellachie Village Council. Thousands of rope lights have been hung in trees at the entrance to Craigellachie to brighten the road for motorists arriving from Dufftown. Now, the village council plans to erect a star at the peak of the village hall that would be visible for miles around during the dark winter nights. During the last two years, the group has received support from kind-hearted locals and businesses to add extra sparkle to the little community. 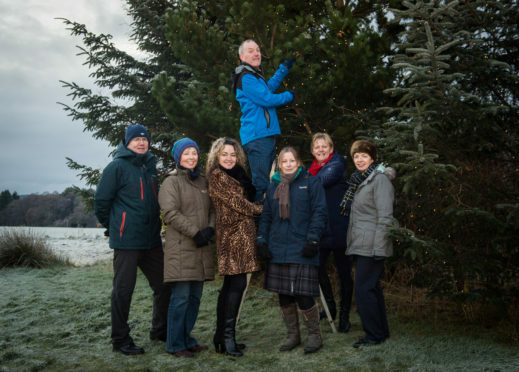 Brenda Cooper, secretary of Craigellachie Village Council, is hopeful that others will be inspired to contribute to the decorations after seeing the recent additions. She said: “As you’re driving from Rothes, you can see the village hall in the distance. It’s a lot more visible than people think, so we’d like to put a star up there – just to keep with the Christmas spirit. “However, we think we would need to have the outside of the building painted first as it is looking a bit worn. Local couple Scott and Jodi Turner donated the lights to line the fencing surrounding the tennis pavilion, which is maintained by the group, last year. Volunteers have spent the last two weeks on ladders to wrap foliage around the entrance to the village from Dufftown with battery-operated lights donated by the Speyside Cooperage. Further helpers are expected to be required to help paint the hall in Craigellachie and create a star to shine brightly from the centre of the village. But the attraction has already gained a favourable reaction from those who have witnessed it, both locals and visitors to the region. And it seems likely the local spirit will continue to sparkle in the weeks ahead. Speyside Glenlivet councillor Derek Ross said: “There is a fantastic group of people in Craigellachie who deserve all the help they can get to improve their community.